This vegan and gluten-free Quinoa “Fried Rice” tastes like takeout but is made with whole grains, veggies, and an easy sauce. Serve it with edamame or grilled salmon if desired! This quinoa fried rice has no rice. And no fried. It’s kind of like flourless cookies. And grain-free oatmeal. And cauliflower rice. It defies the very definition of the food itself; yet we’re all a little into it? Lately I crave things that can be enjoyed both hot and cold. Things that are delicious until proven guilty. Things like this riceless friedless quinoa fried rice. If you’ve made my Easy Vegetable Teriyaki Stir Fry before, you know I love a good one meal wonder. Now let’s talk grains. Unless you have the frozen pre-cooked kind, rice takes a helluva long time to cook. Like 45 minutes too many. Quinoa, while difficult to pronounce, is not difficult to cook. It takes a mere fifteen minutes to serve up the fluffy, protein-packed goodness that is this pseudograin. Yep, quinoa is actually a seed!! We’re all just pretending to be things we’re not, here. To keep it easy, I seasoned up this whole grain n’ veggie mixture with a simple mixture of sriracha and reduced-sodium soy sauce. Feel free to add some sesame oil if you want to raise the flavor roof. For all the gluten-free folks reading, feel free to use tamari instead! There are so many places that this dish could go. Add edamame for more plant-powered protein. Add scrambled eggs for an authentic twist. Add more greens to make it more of a salad. 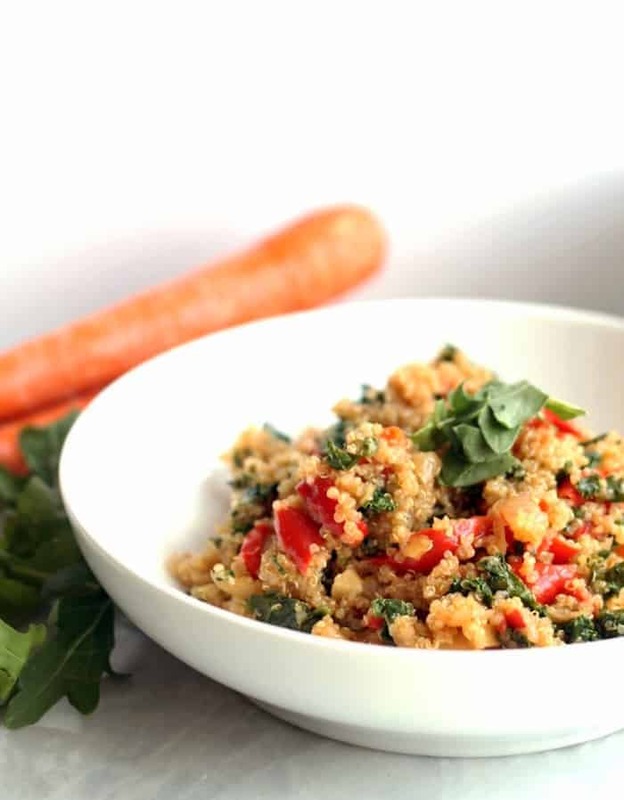 Try this Thai Quinoa Fried Rice for a super yummy peanut butter version. This Instant Pot Pad Thai Stir is another winner! Oh the places quinoa will go!! This vegan and gluten-free Quinoa Fried Rice tastes like takeout but is made with whole grains, veggies, and an easy sauce. Serve it with edamame or grilled salmon if desired! Place quinoa and water in a medium pot. Bring to a boil. Once boiling, reduce heat to low and simmer covered for 15-20 minutes, or until the liquid is absorbed. Meanwhile, chop all the vegetables. When the quinoa is cooked, dump into a large bowl. Wipe down pot. Add oil to pot and heat over medium heat. Add onions and carrots and sauté for about 10 minutes, stirring often. Add peppers, edamame, garlic, and ginger and sauté for another 5 minutes. Add kale and sauté just until wilted (a few minutes). Add cashews. 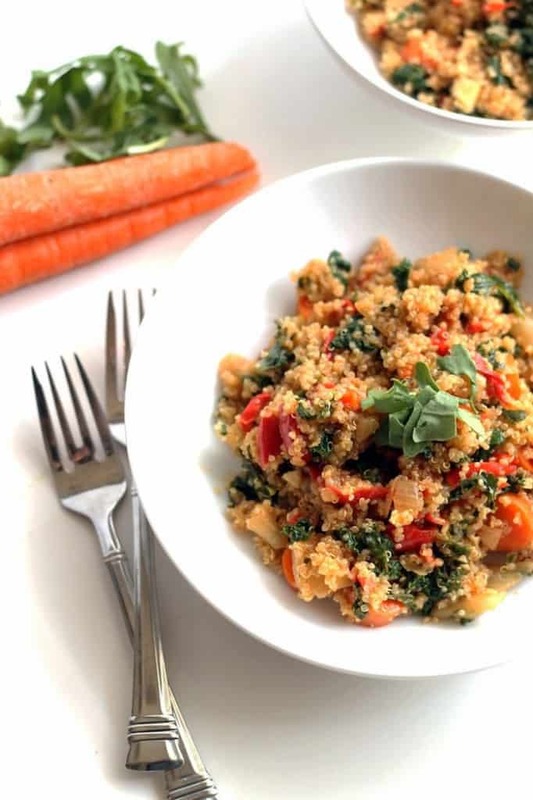 Dump cooked vegetables into bowl with cooked quinoa. Add soy sauce and sriracha and stir well to combine. Serve warm. Ahh i love this and I love that you mentioned eating it hot or cold! I forget that sometimes. Hot or cold = amazing. Thanks love! Veggies make everything so much prettier, don’t they? I basically never make rice because it takes forever, quinoa to the rescue! I’m digging this with the addition of an egg- yum! Right?! You should totally add an egg and never look back!! SOOO smart to make it in the rice cooker. How do I not have one of those?! Yum! this looks a whole lot healthier than the shrimp fried rice I had at my favorite Chinese restaurant yesterday. Wahhh. Definitely gotta try your version soon! Hahah I hope it’s healthier AND yummier! I purposefully run the rice cooker for leftover brown rice for healthy ‘fried’ rice. 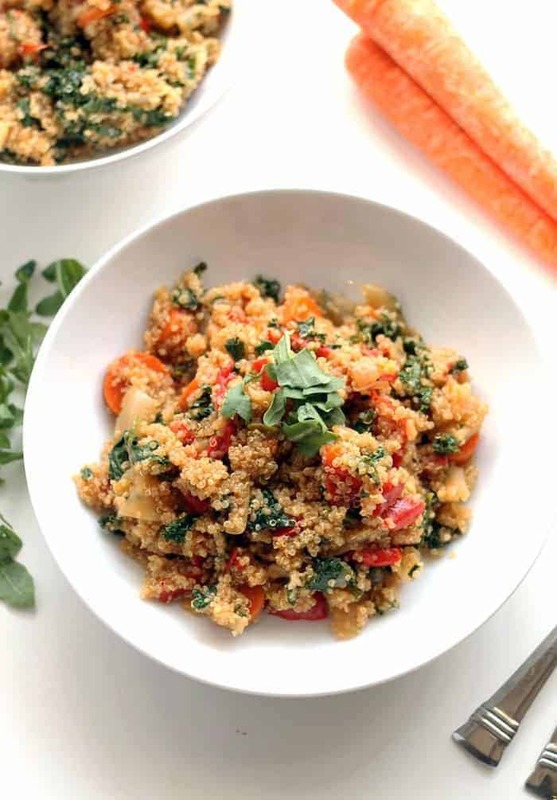 Love the idea of quinoa! I would be the one to add the scrambled egg because I love sticky clumpy rice. Mmmm! Pinned, shared, and currently salivating over right now! ;) YES for fried rice day! Faux fried rice is duh beez kneez, suga! I love this quinoa idea! And, stop: The Ginger People makes bottled minced ginger?!! I need this 10 years ago! Happy Mondeeee! Faux fried rice…I love it. The bottled ginger is going to ROCK YOUR WORLD!!! LOVE! I’ve been stuck on rice lately, but I really need to start doing the quinoa thing again because it’s so, SO good. And cold leftovers are seriously the love of my life. I actually prefer eating most things cold than I do hot! We’re totally in the same boat! Like I think I’m grown too lazy to throw things in the microwave. Unacceptable! I have never cooked quinoa before, mainly because it looks and sounds intimidating. That needs to be fixed ASAP. This looks yummy! It’s SO easy! Go for it! This sounds delicious! Getting a rice cooker was a game changer for making rice. It takes like 15 minutes now! That’s amazing. I really need to invest in one! Btw, the intro to this post is amazinggggg. You are such a clever writer. Um…….yes. Can you please pre chill this for me pre Columbus? DUHHHH. We can have a picnic in the park. I’m way excited about this recipe! Fried rice is my guilty pleasure, so I’m pumped to have a healthier version! I made this for dinner tonight but I put it over a bed of spinach and omg it was amazing!!! Thanks for the Recipe! I like this. A healthy dish indeed! What makes it even better is it can be serve either hot or cold. A very wonderful “fried” rice dish. Just wanted to let you know that I’m obsessed with your site. I feel like I’m going to be trying a new recipe (or 2 or 4) a day until I’ve tried them all…curry chickpea salad…CHECK! Quinoa Fried Rice and Loaded Veggie Avocado Tuna Salad, here we come! Snagged this from Alchemy today and googled the recipe after my first bite. In love and will be making a huge batch for lunches. Thank you! 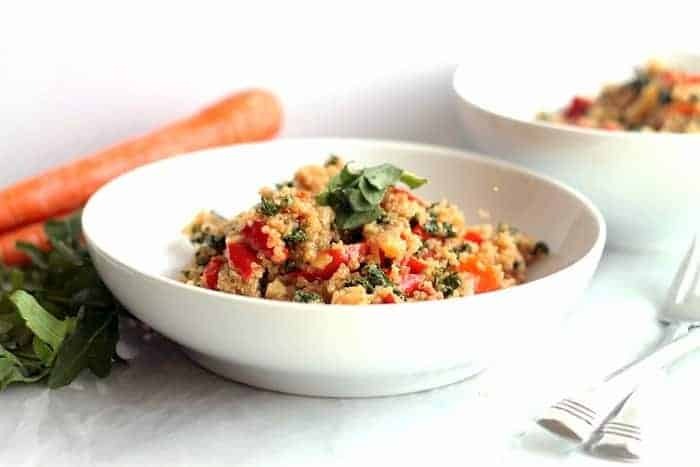 I cook brown rice in our pressure cooker, so I always have rice in the fridge and freezer, ready for ‘fried rice’, but I also like the idea of using quinoa for a nice change. Thank you.